What Order Is The Wedding Procession? What order is the wedding procession depends entirely on where in the world you are and your religious traditions, to help you with your wedding plans I have put together a simple guide to most wedding ceremonies. Your wedding procession is the order that you enter for your ceremony and although there are traditional orders for weddings don't feel you have to follow them. Instead you could all gather at the ceremony for an informal wedding, you may want to walk in together as bride and groom, it is your wedding so be happy with what you choose. Who Sits Where At Your Wedding? To start with you will want your guests to take their places, quite often you will have the bride's family and friends on the left and the grooms on the right, unless you are having a Jewish ceremony when it is the other way round, bride's family on the right and groom's on the left. If it is a Jewish Orthodox ceremony then you will have men on one side and women on the other. At a Hindu ceremony the wedding guests will be waiting under the mandap with the bride and her family for the groom to arrive. At a Muslim wedding the groom and his party will arrive at the bride's family home or wedding venue. 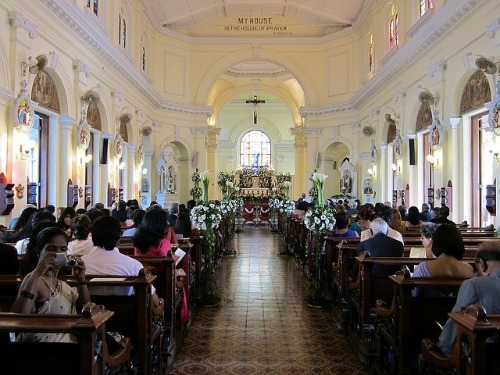 For a Christian wedding the grandparents will enter first, followed by the parents of the groom, next the mother of the bride escorted by an usher or groomsman. If you are in the United States then the bridesmaids will enter next each escorted by a groomsman, then the ring bearer and flower girl. Then the bride and her father or family friend. If you are in the UK, after the mother of the bride will be the ring bearer and flowergirl, then the big entrance of the bride and her father followed by the bridesmaids. In both cases the groom and bestman will be waiting at the front. If you are having a Jewish ceremony first will be the rabbi with chuppah holders unless you are using a freestanding chuppah. Next the grandparents, followed by the ring and flower bearing children, then the bridesmaids and groomsmen, followed by the bestman and maid of honor. Then the groom with his parents and then the bride with hers! For an Indian wedding the groom arrives for the wedding with his family and friends in a procession and they are received by the bride's family and friends. What order is the wedding procession for a non-religious ceremony is entirely up to you, you could use elements from the different weddings already spoken about or make up your own! If I haven't covered a particular religion or custom in what order is the wedding procession drop me a line in my help section and I will find out the answer for you!